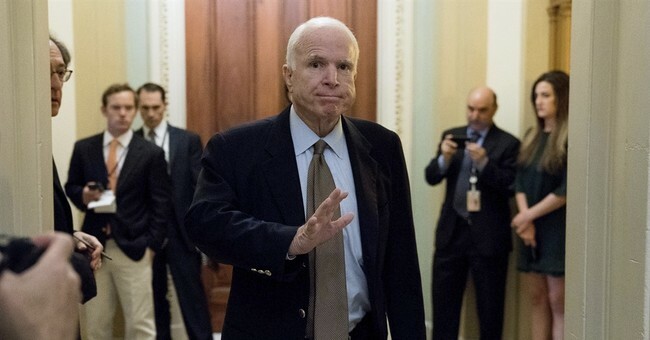 Sen. John McCain (R-AZ) was one of three Republicans to vote against the GOP's effort to repeal Obamacare last week. He, along with Sens. Susan Collins (R-ME) and Lisa Murkowski (R-AK), all failed to support it. Collins was worried that the bill was on course to hurt the country's "most vulnerable" communities, for it would not add any funding for Medicaid. Murkowski, who even voted against a motion to proceed to debate on the bill earlier in the week, faced much of President Trump's Twitter wrath. He accused her of letting down her Alaskan constituents, Republicans, and the country at large. "Too bad!" Now, McCain is opening up on his own "no" vote, insisting he had Arizonans in mind. "Arizona was about to get screwed, if I may, under this plan," the senator told radio host Mike Broomhead Wednesday. Arizonans are already struggling with high premiums and deductibles, not to mention they have only one insurer to choose from, leading McCain to believe repealing Obamacare would do more harm than good. McCain was also not pleased that he apparently would have no say on the final bill. "I had no input frankly as to how it was going to be fixed except to vote 'yes' or 'no' once it came out of the conference," he told Broomhead, adding that the conference would be "short-circuiting" the process of amending the legislation through repeated committee hearings and debates. Despite McCain's complaints, many conservatives would argue that McCain, Collins and Murkowski just "screwed" the entire country. How is American health care going to improve now that we have to stick with the status quo of Obamacare? At the very least, the Senate Health Committee announced that it will hold bipartisan hearings next month on how to repair Obamacare's individual insurance market.